To get what you want, you need to first know what you want — and then ask for it. Knowing how to ask for things in business and in life can lead to achieving personal and financial success. Yet, why do so many people have such a hard time asking for things? Sometimes, the only thing standing between getting what you want and not getting what you want is simply asking. But before you ask anyone for anything, you have to know what you want. If you don’t, you probably won’t ask for the right thing and you won’t get what you’re after. People can’t read your mind, so often you need to specifically ask for things. Don’t assume one of your clients, or potential clients, knows what you want. And don’t think it’s being pushy to ask for what you want — it’s business! And above all, don’t make the mistake of subconsciously believing you shouldn’t have to ask. 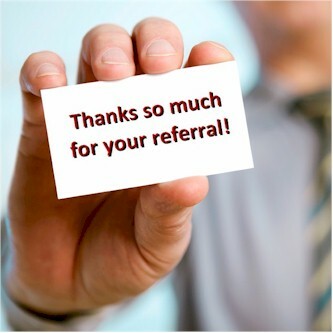 One of the key benefits of referrals is that they can quickly increase your client base and income at little or no cost. All you have to do is ask. There’s nothing cheesy about it. The best time to ask for a referral is when you’ve just completed work for someone. Ask the client, “Are you happy with the work we have done on this project?” If you’ve done a professional job, the client will be happy. Don’t be shy to ask follow up questions where appropriate, such as: “How many other people in your industry do you think could benefit from our services?” so you can gauge how many potential referrals you might ultimately try to acquire. You may feel as if you’re putting a client on the spot, but if they’re happy with your services, they’ll have no problem introducing you to a colleague. It’s Not Selfish to Ask! Asking for what you want is not selfish — again, it’s business. Think about confident people. They are the ones who have no trouble asking for what they want. Most people who specifically ask for what they want usually get exactly what they have asked for. Yes, asking for what you want may cause you some initial anxiety, but once you realise you’re successful more than 50 percent of the time, that anxiety will turn into confidence. Being able to ask for what you want is vital to the success of your business. Being self employed, we know that if we don’t have work, we don’t have money. There’s no time for shyness when communicating with existing or prospective clients. So, start changing the way you think and start asking clients for what you really want.